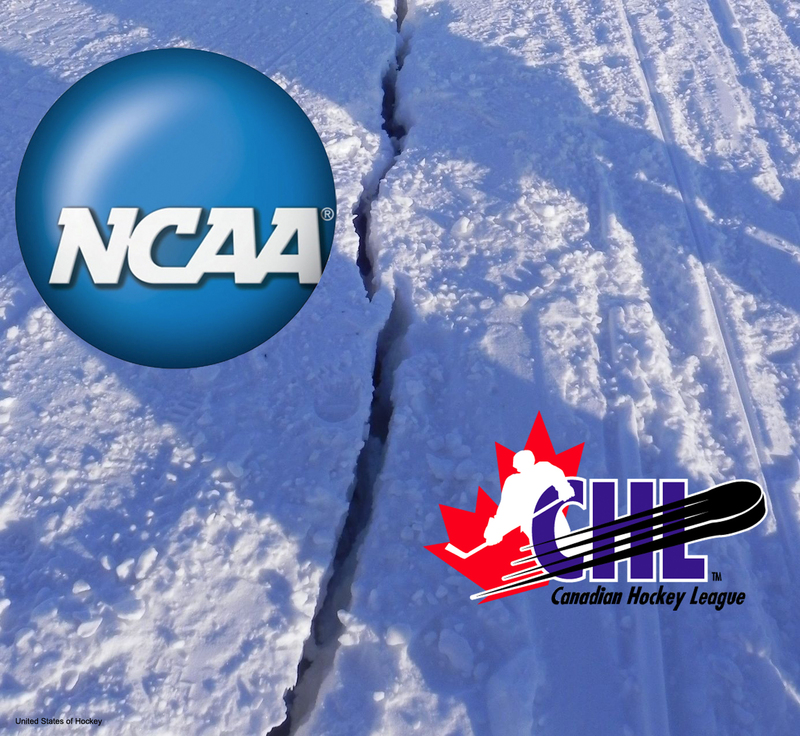 What changes need to occur to allow Canadian Hockey League (CHL) major junior players to be granted eligibility to play in US college system, the NCAA? The NCAA requests two alterations: 1) remove the stipend 2) remove the classification of “major” junior. 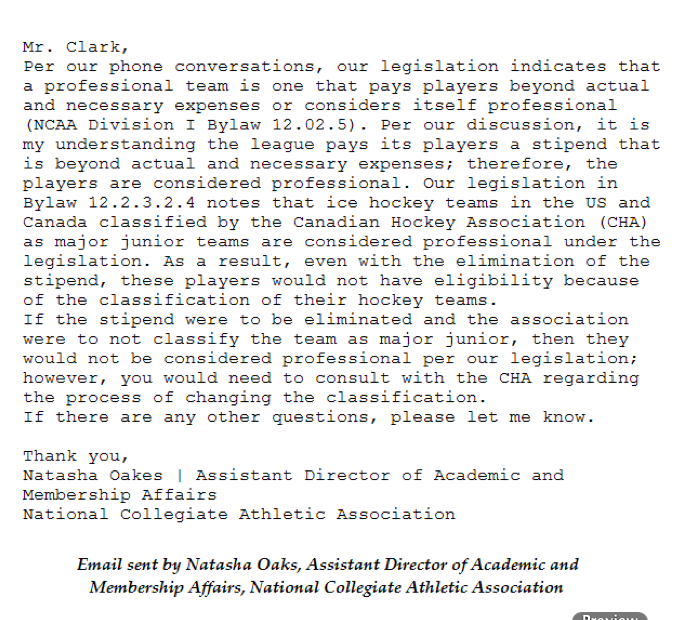 The letter below received by the CHLPA from Natasha Oakes, Assistant Director of Academic and Membership Affairs of the NCAA, outlines the distinct barriers disallowing CHL players NCAA eligibility. I received this document from an inside source and was puzzled by the simplicity that would be involved in allowing CHL players to head down South. Then I began wondering what the ever so modest “stipend” CHL players receive is really for. The stipend ranges anywhere from $50-$150 dollars bi-weekly, received by players in the form of a pay stub. With the millions of dollars in revenue the CHL brings in every year, there is no doubt that franchises could very well afford to pay players the appropriate amount: minimum wage. This leads me to question whether or not the stipend is merely a tool put in place to contaminate a player’s NCAA eligibility. Whether or not the stipend is a strategic barrier remains unclear, however it should raise questions. Questions such as: Why after extensive talks, were CHL President David Branch and Hockey Canada President Bob Nicholson unable to reach an agreement with the NCAA? Why is the CHL resisting putting in place basic changes that could provide its players with an excellent educational opportunity? Who is profiting from these restrictions and to what extent? My opinion on the document above is not necessary, and I certainly won’t waste your time by going into stark detail. What is really important are the questions that arise within you. Not sure if you’ve been following the “On The Edge” TV series on Sportsnet, which follows the Saskatoon Blades of the WHL. Not only do these players get paid a small amount, but it looks like teams really cut as many corners as possible to save a few bucks. The kids have to take 12 hour bus rides PLUS load and unload their own gear! I understand the whole “paying your dues” thing, but I cannot understand who is profiting off of these kids. Whats also interesting is that the CJHL Jr.A. teams across Canada (the teams players play on while trying to attract NCAA attention) ALSO have stipends, per diems, 12-hour bus rides AND have to unload their gear from busses! Older 19/20/ year old players in CJHL have also been widely known to be paid $5,000-$20,000 a year and still seem to maintain NCAA eligibility. But that story wouldn’t make good press for the anti-CHL factions out there!